Choose Access Package and get started with premium entertainment for the whole family. In this pack you have a selection of great regional and international content. With Access, you would be able to watch local football and other sports, general entertainment and lifestyle channels, leading news and factual channels and four kids channels. Movie lovers can also enjoy watching one movie channel in this package. 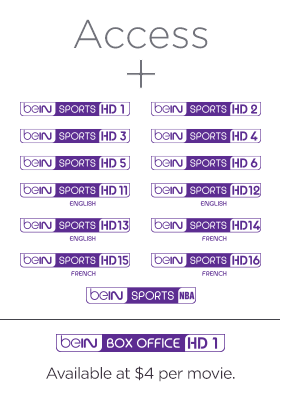 The perfect way to start watching great TV with beIN Full HD channels. Select Sports Package and unlock the world of local, regional and global sports. With Sports package you can watch all the international and regional leagues like La Liga, EPL, Bundusliga, Liga 1, Champions League as well as regional premier tournaments like CAF. In addition get access to other premium global sports like Tennis, Rugby, F1, Golf and athletics. If you are a sports fan then this is the best package for you. Choose Entertainment Package and enter into the world of non-stop entertainment. If you are a movie buff and like watching latest movies then this is the package for you. With this package you get additional movie channels which are bound to entertain you and your family. 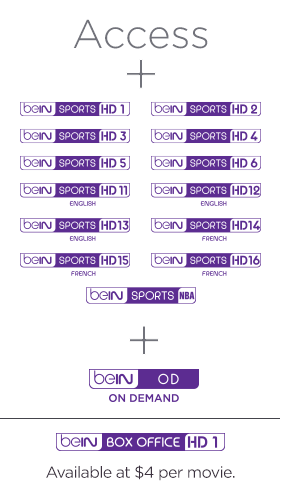 The Entertainment Package includes the premium beIN Movies 1 HD, beIN Movies 2, beIN Movies 3 HD and beIN Movies 4HD channels which will feature latest family, drama, romantic, action and thriller movies from around the world. 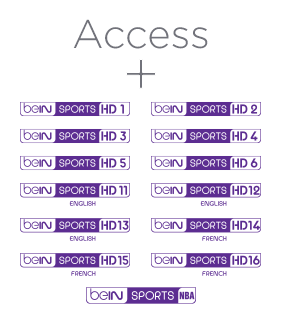 Get everything that beIN has to offer from amazing sports to blockbuster movies, thrilling general entertainment and lifestyle channels, non-stop fun for kids, factual and news channels and much much more. In this package best of both worlds ie. sports and entertainment meet to create a package which will really keep your whole family entertained. Look no further, with Complete Package you don’t need any other pay TV as you can get everything you want through a single decoder and in a single package. Subscribe to Elite package and you don’t have to pay any additional fees for special events (like World Cup & Euro). 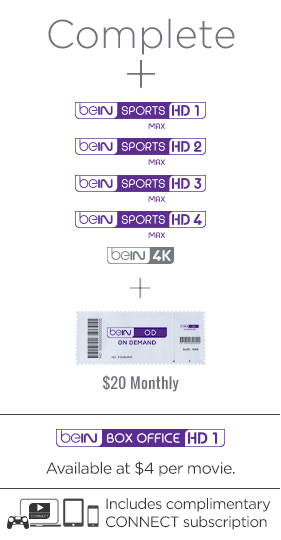 Within this package, you get all the channels on Complete Package plus $20 credit monthly for beIN On Demand plus free Connect and free access to all events (World Cup 2018 or any other event offered). This package offers amazing content and absolute convenience. Subscribe to Elite package and get all the channels on Complete Package plus $20 credit monthly for beIN On Demand plus free Connect. This package offers amazing content and absolute convenience. Elite package is a great combination of all beIN content. This is an “all-in-one” package for the most discerning customers who want to relax and enjoy all beIN offered content. The Entertainment Package includes the FOX MOVIES, FOX Family MOVIES, FOX Action MOVIES, Star Movies, Star World, and TCM featuring the latest family, drama, romantic, action and thriller movies from around the world. *Terms and conditions apply. Prices stated exclude taxes. Additional value added tax applies in Algeria, Chad, Jordan, Lebanon, Morocco, Mauritania, Palestine, Sudan, Tunisia, Yemen. *Local currency prices may vary depending on the exchange rate.